I have a little secret…a secret obsession with thrift store art. It’s just one of those things that happened when we were trying to decorate our last home. 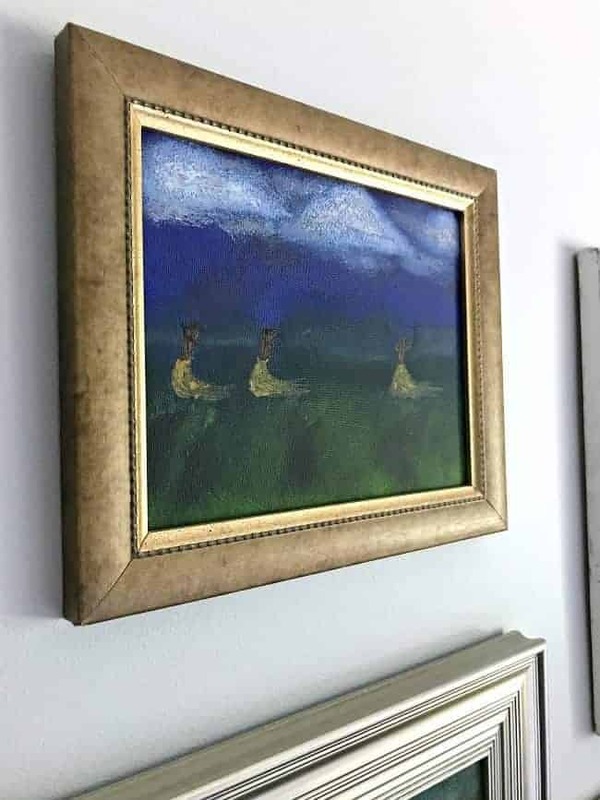 When we lived in Illinois, the land of amazing estate sales and thrift stores, I’d look around for inexpensive art pieces for our (then) new home. On one trip to a favorite local thrift store, a small, framed watercolor caught my eye. For $1.50 I just couldn’t pass it up, so I bought it, took it home and hung it up. Since then, it’s something I always search for when thrifting. My collection has grown some since that day but we still have a small space, with limited storage, so I try to be a little choosy with my purchases. It just has to be pretty, to me anyway, and it must be under $10. As you can tell, I’m usually drawn to certain colors and scenes but I don’t put a ton of thought into it. If it catches my eye and I love it, I buy it. I don’t find something every time we go out thrifting. I’ve actually gone months without finding anything. It’s all in the thrill of the hunt, though. Don’t you think? My little collection has grown to 8, with some great finds in the past few months. So what have I done with all of my thrift store art? 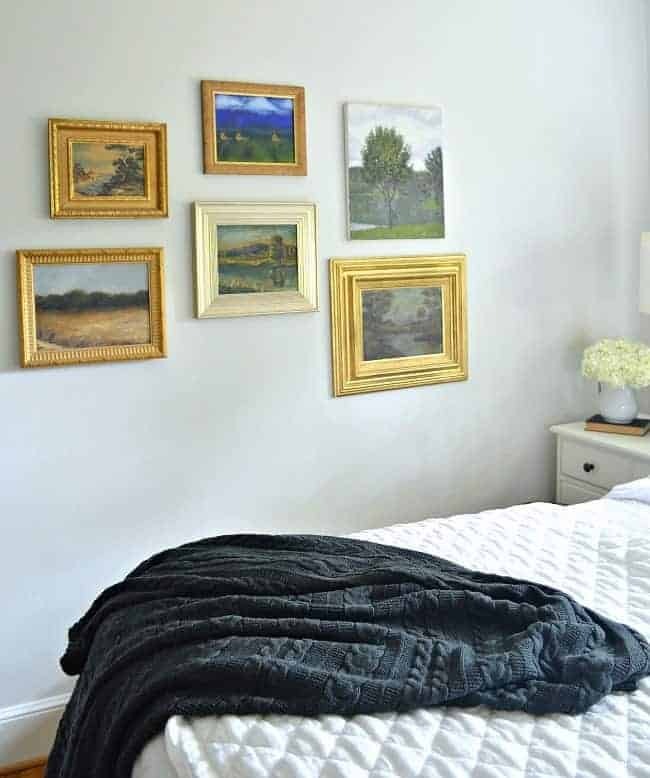 When we moved into the cottage, I needed to fill a wall in our master bedroom. I tried a couple of store bought pictures and a mirror, but nothing seemed right. We’d been unpacking my thrift store art from our moving boxes when it hit me. I could make a gallery wall in our bedroom with all my finds. There’s been no change since I hung the gallery and I’m loving the result. The best part is that it’s all pieces that I love. I mean, that’s what our homes should be all about, right? You should fill it with pieces you truly love. It shouldn’t matter what anyone else thinks because you live there. Your home is your sanctuary so fill it with things that mean something to you. My latest acquisition was found at an estate sale about a month ago. I’m guessing that the person that lived in the house was a painter. I found this little painting all alone, laying face down in a windowsill, and rescued it for $1.50. It’s in the colors I love and it fits perfectly in our cottage. Have you ever found a great piece of thrift store art? It looks like the Thrifty Style Team has been busy this past month. Check out all of their amazing thrifty finds. If you want to catch up on past Thrifty Style Team posts, you can find them here, here and here. That little barn photo is awesome! I need a complete overhaul on most of my frames. Time hasn’t been kind to them. Maybe over winter. I love that little barn picture. I can’t believe no one else scooped it up. Thanks so much for visiting! This is definitely my kind of thrift store art…love it all! The chunky gold frames are truly my favorite. Love it all together. Oddly enough I rarely find art while out thrifting, but I’m going to have to look a little harder, because I ADORE your gallery wall! You have found some amazingly beautiful pieces. I love love love them. You are right it is definitely the thrill of the hunt. But then at the end we have something very unique to fill our homes with. 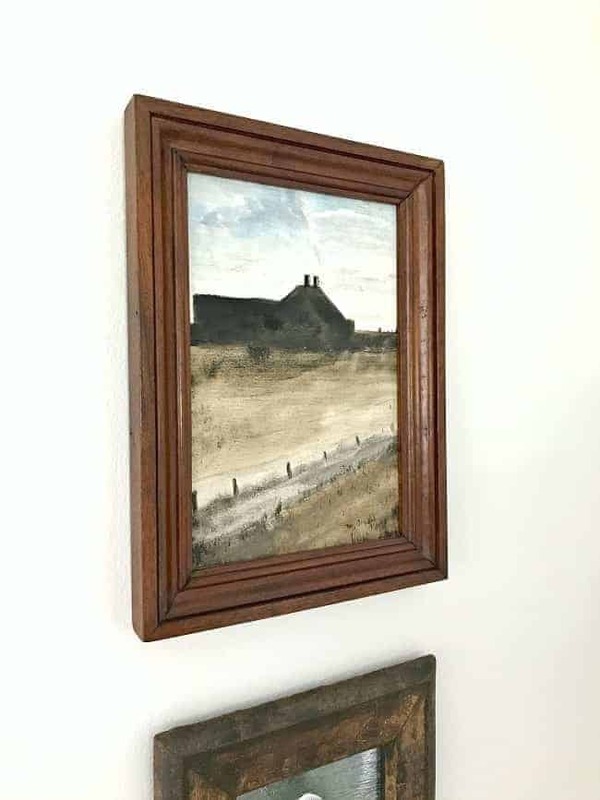 I love that we both shared our thrifted paintings today. Thanks so much Jessica! It’s so funny that we shared similar finds. Great minds, right? Hi: I love the barn painting you bought for 1.50. Is it in oils? I have a wall in the guest room that I have hung some of my own paintings on. I might try this idea behind the sofa, I have always had a single large painting. Boring! We were lucky in this area of Florida to escape major Irma damage. It was a close call. I had torn screens on the lanai and yard debris. Oh, the power of prayer. Some electricity out yet. A terrifying experience. Our beloved Keys are trashed. Thanks Brenda. I love the barn painting too. I couldn’t believe it was still there, all by itself, for $1.50. 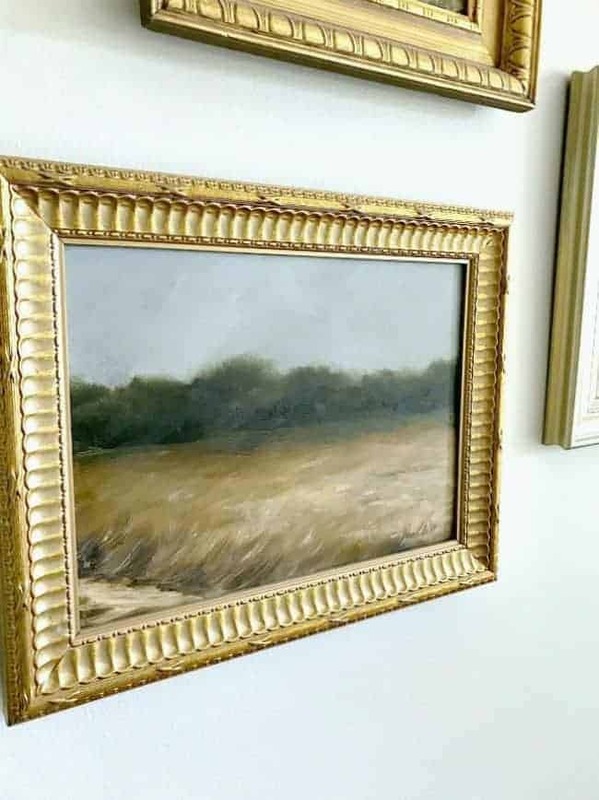 It is in oils and it has a beautiful wood frame. I love the look of oil paintings. They are my favorite. What do you paint? Glad to hear you are ok. We lived in Florida (and lived though Jeanne and Francis) and have friends and family there so we were glued to the tv. So much devastation in the Keys and Naples area. So sad. Take care Brenda! I certainly have bought paintings in a thrift store, there have been some good ones too, just like yours. I love your wall. Kristi, Your Thrifted Art is stunning. You have a great taste and that is real gift. You have given me a great idea for our family room. I just can’t seem to find the right wall art. AND, this might be just right. Thanks, Kristi. Happy Fall. Thanks so much for your sweet comment, Meegan. It’s funny that I had all of this found art but I was trying to use store bought art to decorate that wall. I’m just glad it worked. Your collection look wonderful because you have such great taste! Awww, that means so much coming from you. Thank you! GORGEOUS and classy! Love it. I need to find a spot I can do this too. Thanks so much Deborah! I love that I can see them all together. This looks great! I love the landscape scenes too. I have always love that old burnished gold. It is coming back in style, but it is a classic in my book. Old things give a space character and personality that new just can’t quite mimic. I did something similar in my living room. I stacked three old prints all above an old chair on a narrow wall. I love it! Glad you found a home for your treasures. Thanks so much, Julie! I’m glad I found a home for my treasures, too. Kristi, I love your gallery wall. It’s amazing how all the art fits together so well! Your links to others with fall decorations reminds that I have to get going on my fall decorations. I’ve been preoccupied with the spare room, getting it ready for the grand-boys. They are excited to have their own room at Nana’s house. Sounds like a fun project and I’m sure your grand-boys are going to have an awesome room. 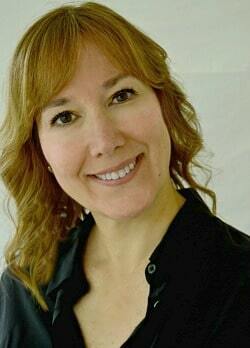 Your art gallery is beautiful, Kristi! My post today is about my thrift store finds from Chicago….they do have the best for sure! Love these, we seem to have the same taste in so many things. I have to ( embarrassing-ly) confess here, and it sounds a little odd, but I don’t know how to thrift shop. Do you look in the paper for estate sales? Go to the goodwill store? Yard sales? ok, I said it. 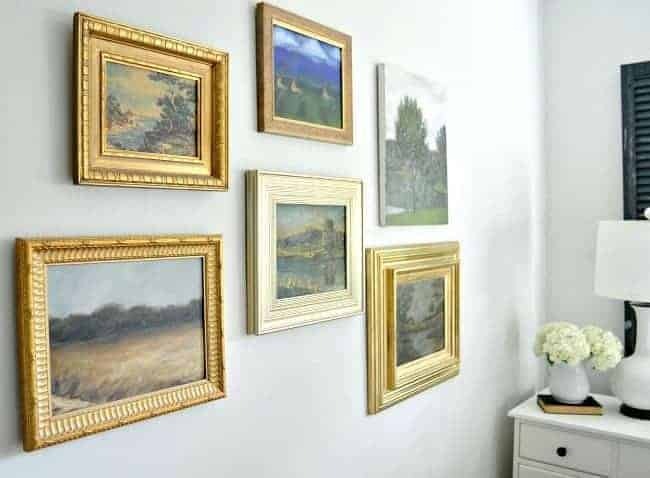 I need to try this, I think I could find room for a cute gallery wall like this. Kristi I really think the key to this is having a great eye and you definitely have that!! These pieces are absolutely beautiful and look so amazing as a gallery. I love it! Awww, thanks so much Vanessa, I appreciate it. I never bought them with the intention of hanging them all together, but I’m thrilled that it worked out that way. I too love the thrill of the hunt!! These are beautiful! The thrill of the hunt is what it’s all about. 😉 Thanks Cindy! 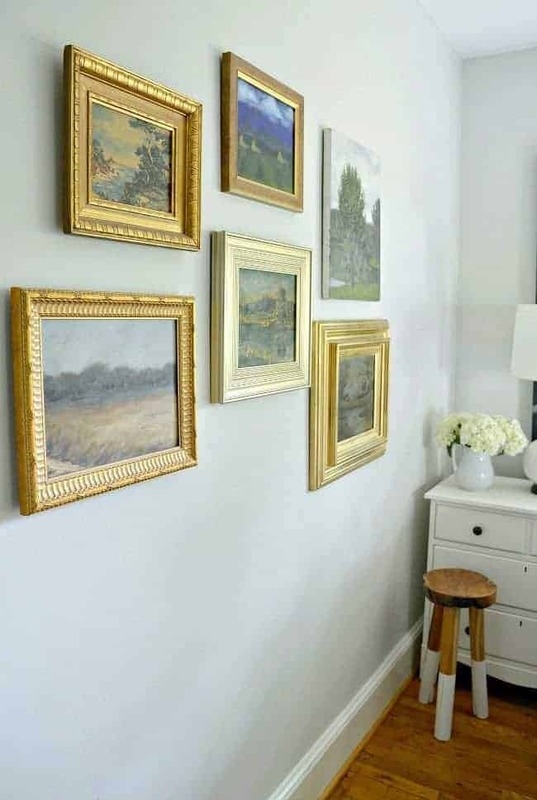 Kristi, I LOVE your gallery wall with the thrifted pieces of art! I am fortunate to live very close to an auction house, and I have found several pieces there for about $5. Currently one is hanging in our den. The trouble is that I want to rescue all of the pieces that I see but have NO space for them! Thanks so much Jane! I have to be very careful about rescuing too many pieces too. It can get out of hand pretty quickly. Very cute! My husband just grabbed a few pieces from the trash. I can’t believe what treasures people throw away! It’s funny how prices differ at thrift stores from state to state. We went to Myrtle Beach last May and went in several and the prices were totally ridiculous. Of course, it’s a tourist area but it was crazy expensive. Kristi, I love your gallery wall. Great idea and it looks fabulous!